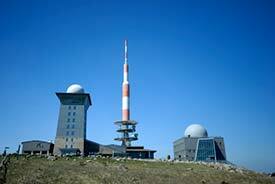 ABOVE: A summer view of the Brocken, with its signature TV antenna in the center and the Brockenmuseum (a former GDR listening post) on the right. But geography is only one reason to visit the Brocken: The mountain has long been the focus of myths and legends, from Goethe's Faust to traditional stories about witches and devils. Even today, Hexen or witches are part of the local folklore, and on Walpurgisnacht (the night of April 30), thousands of local residents put on costumes, ride trains to the summit of the Brocken, and celebrate latter-day witches' revels. Whether you're a Wiccan or merely a Halloween witch, the Brocken is a worthwhile pilgrimage--if only because the approach by HSB narrow-gauge steam train is so enjoyable. The Brocken is also of historical interest. You can still see the "cloud cabin" that Count Christian Ernst built on the Brocken in 1736, and the Brockengarten, a botanical garden laid out in 1890, has been restored by park authorities in partnership with the Martin Luther University of Halle-Wittingen and the Georg-August University of Göttingen. The TV antenna on the summit is a reminder that the first Olympics television coverage was broadcast from the Brocken in 1936, and the current hotel on the summit is the latest in a series of inns dating back to 1800. Whether you're a history buff, a hiker, a railfan, or simply a tourist who enjoys panoramic views, a trip to the Brocken's summit is a "don't miss" excursion from nearby Wernigerode and other towns in the Harz Mountains. For visitor information and more captioned photos, click the links below. Top photo and 3rd inset photo copyright © Carsten Madsen. 2nd inset photo copyright © Andreas Weber.